Short-term success witness light of the day quite early – especially when you are looking for success by selling products like concert tickets. Longtime successes take time but long lasting in nature than the short-term ones. Out-of-home advertising can help you achieve both forms of successes if implemented accurately. Whereas, there might not be any other medium that can handle both these mediums simultaneously. And even with the help of smart billboards, you can easily share your ideas with the target audience. So, how to achieve both long-term and short term goals utilizing the power of outdoor media? Let’s find out in the later part of the article. Initially, you need to create a strategy as you never know that your campaign is a success or not unless you set your target audience. It also counts on what you want to feature through your advertisement. Short-term goals are basically a set of activities; you need people to get engaged with your product. This type of advertising goals can be measured and analyzed. I.e. you can easily track how much merchandise is sold during a sale you advertised on a billboard compared to the sale you did not advertise. Most of the short-term campaigns succeed due to their instant impact. In almost 90% of the cases, the objective of long-term campaigns is to establish the brand for a company. You set your long-term campaign to generate awareness and tell the audience why they should try your product. For example, there are some cafes in your locality but you installed a billboard claiming to be the best coffee maker. Now, why should people choose yours over others? Because you care for something, that attracts people. Apart from the above strategy, another form of attractions can be to give 5 percent of profit to a charity or for a noble cause. If you focus on your niche in your advertising and turn it into your calling card, you can draw many people to your restaurant. Short-term success can be a part of long term-goal but it cannot guarantee the consistency in the long term success. While the strategy more or less remains the same but the difference lies in the implementation. A customer visiting your store after noticing a billboard advertisement may buy your product but may also forget about the brand once go back home. Optimal mix is a great combination for billboard advertisement which is distributed in the 40:60 ratio. The distribution works in 40% for short-term goals and 60% for the long-term one. The mix works in other media also, like digital media. What is Flighting and how can it boost your billboard advertisement? Flighting stands for optimum. I.e. most companies stay away from the last or fourth-quarter as it remains noisy. Everyone wants to run their campaign on holidays and one can get lost in the cacophony. In this case, a long-term advertising strategy can be put on board and stop new ad-spent until the start of the New Year. If your ad is not time sensitive like in holidays or discounted sale, you can schedule your ad at any point of time and the best bet is to buy the inventories while they are cheap. Each ad platform can be tried as flickering through these ad formats might help in the expansion of brand awareness and building the brand for a long term return. What is the difference between rational and emotional Outdoor Advertisement? Short-term outdoor advertising is considered rational. You get benefits of selecting a particular brand –the customer saves a lot after a few purchases. Long-term outdoor advertising is considered emotional. You cash in on the emotional benefits of selecting your brand, something that connects with people and gets established over time. Emotional advertising does not mean trapping customers rather it appeals emotionally to your audience that in return strikes in their mind for a long time. The One-day Billboard and other stunts: Can they benefit you in your branding? This is the latest trend that can be noticed across the globe. Companies have been putting up billboards only for a day. Thereafter, the same campaign is shared and promoted across social media channels to engage a higher number of audiences and rip long-term benefits. In most of the cases, one should buy a digital billboard to make the one-day flight a success as buying a traditional billboard would be costly and can backfire if not implemented properly. But if you have some effective pictures you can tweet them for a month-long digital stunt resulting in the long-term success of a short-term campaign. At the end of the day, success for every campaign translates to the meeting of their goals. 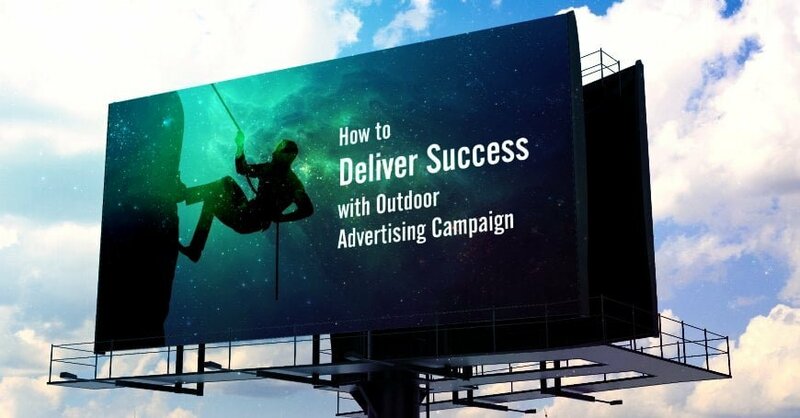 Outdoor advertising can boost both your long term and short-term goals. When you can create a buzz for your product and build an effective relationship with your customers, you have achieved your goal. And, if you are still not sure and require any help, you can contact us for guiding and helping you throughout this process.